Lexmark 1382140 Premium Quality Compatible Black Toner Cartridge designed to work in the Optra N 240/ 245 Series printers. The use of compatible supplies does not void your printer warranty. Lexmark 1382925 Premium Quality Compatible Black Laser/Fax Toner designed to work in the Optra S1620n/ S1625n/ S2420n printers/fax. The use of compatible supplies does not void your printer warranty. 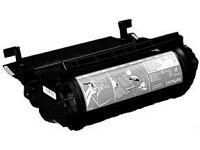 Lexmark 69G8257 Black Premium Quality Compatible Laser Photoconductor unit designed to work in the Optra E/ E+ printers. The use of compatible supplies does not void your printer warranty. Genuine Lexmark 12A0825 Black, High Yield, Return Program, Toner Cartridge for Lexmark SE 3455 printers. Genuine Lexmark 12A5745 Black, High Yield, Toner Cartridge for Lexmark Optra T610/ T612/ T614/ T616 printers.